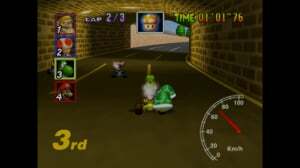 Taking a bunch of Mario characters and having them speed around race circuits using a range of special items to rush or smash past each other is something that has worked very well since the Mario Kart series began in 1992. 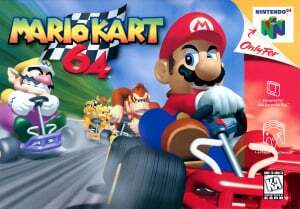 The games are amongst the most enjoyable on whatever platform they turn up on, and many people buying Nintendo hardware look forward to the inevitable karting action that will be appearing on their system. To not release a new Mario Kart would be a foolish move akin to ignoring F-Zero for over ten years, bringing out an amiibo-focussed Animal Crossing board game in lieu of a regular series entry or charging money for Urban Champion. The Wii U, of course, has the brilliant Mario Kart 8 whilst backwards compatibility and Virtual Console releases have made a number of the earlier games available too; the latest eShop arrival being Mario Kart 64. This second title in the series was originally released for the Nintendo 64 (clue was in the title) and has of course been available to Wii U owners since launch via the Wii Menu/Shop Channel. For the Wii Virtual Console release time trial ghost data could not be saved as the Controller Pak was not emulated, and unfortunately that is still the case here. One improvement for gamers in Europe and Oceania, however, is that after getting the slower PAL-region release on the Wii, this Wii U download is the US version in glorious 60Hz. 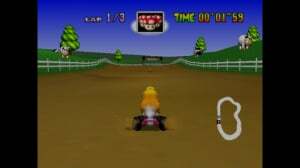 Mario Grand Prix is the main mode of play where you pick one of eight characters, then race the other seven in four cups, each featuring four three-lap races. Available to play alone or in two-player mode, the cups can be tackled at the usual 50, 100 or 150cc difficulties and a mirror mode can be unlocked too. Points are awarded for a top four finish, collect enough points and you may earn a trophy at the end. 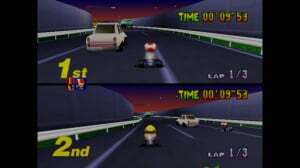 In a race you must finish in the top four to proceed to the next track; this can be used to your advantage as if a rival has finished ahead of you, you can slam on your breaks, drop to fifth and try again. Making use of the more powerful N64 hardware, there was a graphical upgrade over the first game with the SNES' Mode 7 ditched for a combination of polygons (the tracks) and pre-rendered sprites (the racers). There are more things to look at around the circuits and this is apparent from the first track with advertising boards and trees off to the side, an action-mirroring video screen and a drive through a tunnel – the light adjusting accordingly. Elsewhere in the game there are waterfalls, caves and a simple but effective snow effect. The visuals are not without fault, however. Track edges and scenery at times looks very angular and the sprites of the racers can look rough around the edges, but generally the bright, cartoony style works well - particularly when viewed on the GamePad. Sound effects add to the experience with revving engines, hard thumps, screeching brakes and voices accompanying the on-screen action. There are some very effective sounds such as when you drive over a rickety bridge or the shattering of the ice that surrounds you after Lakitu has fished you out of freezing water. The music is very catchy, typically upbeat, exciting and matching the locations well such as the Carribbean sound to Koopa Troopa Beach, or the more sinister sound of Bowser's Castle. The biggest change the switch to polygons provided is that it allowed Nintendo to add elevation to the tracks. 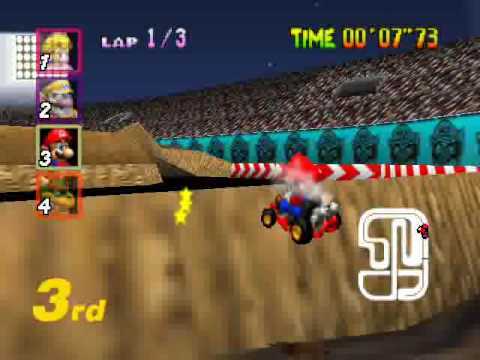 Many Mario Karts later it's not something unusual, but at the time the use of slopes, drops and uneven terrain allowed for different racing experiences to its predecessor. There's the usual range of locations across the sixteen tracks with relatively traditional racetracks alongside mountainous terrain and wintry stages. The game has some memorable tracks such as Toad's Turnpike where you weave through vehicles on a public road, Choco Mountain where you have to look out for falling rocks or Kalimari Desert where you must decide if you can get over the crossing before the train arrives, or if you must stop and wait for it to pass. There's a lot of fun to be had racing on these tracks, with one highlight being Yoshi Valley, a course with multiple routes, plenty of places to fall off and the positions of all characters hidden until they've finished the race. 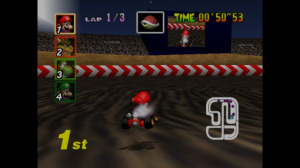 Including tracks from previous games is something of a Mario Kart tradition, but unfortunately it's a tradition that would not start until the third game. Many of the tracks from Mario Kart 64 would return in subsequent titles however, and in fact should you have picked up all the other Mario Karts playable on Wii U only four of the sixteen tracks here are "new". There are differences though (and Mario Kart DS is single-player only on Wii U), whilst these are the original versions of the tracks with the original choice of characters, handling the way they originally did. 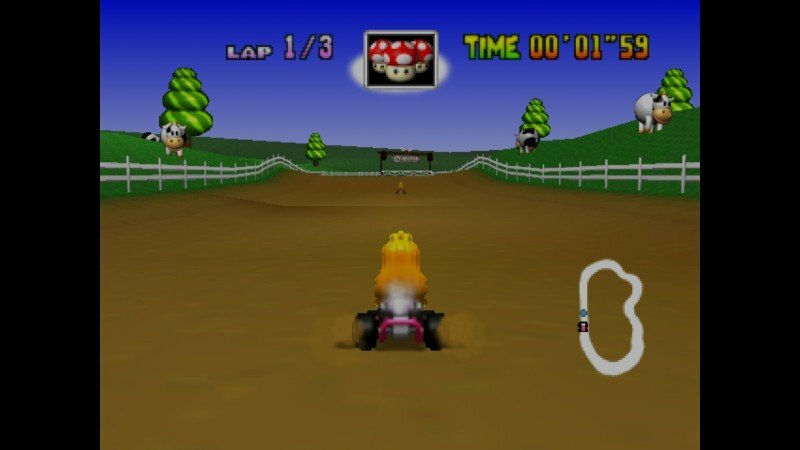 It's Mario Kart from a simpler time, when the go-karts were go-karts and all you had to do was pick a character rather than faff about selecting tires. Characters have different top speeds and acceleration, whilst the heavier you are the better chance you have of muscling your way past someone. The controls are as straightforward as you would expect with the usual buttons for acceleration, hopping and using the special item you've collected. There's also a button for breaking, not something you'll typically need but worth remembering as a quick press after colliding with a banana skin will stop you spinning out. The controls work well but you may want to do some button remapping as the defaults on the various compatible controllers are not always ideal. Hopping is used to slide around corners and it's also possible to get a mini speed boost. It can take practice to perfect as you experiment on different corners on different tracks, but it's worth persevering with if you are hoping to get around the track as quickly as possible. As always you can pick up a special item such as a Koopa shell (green or homing-red variants available) to throw or a speed-boosting super mushroom, and this is the game that introduced multiples of some items like a bunch of bananas or triple Koopa shells. Also making their début are fake item boxes, the golden mushroom that provides as many speed boosts as you like for a limited time and the infamous blue shell. 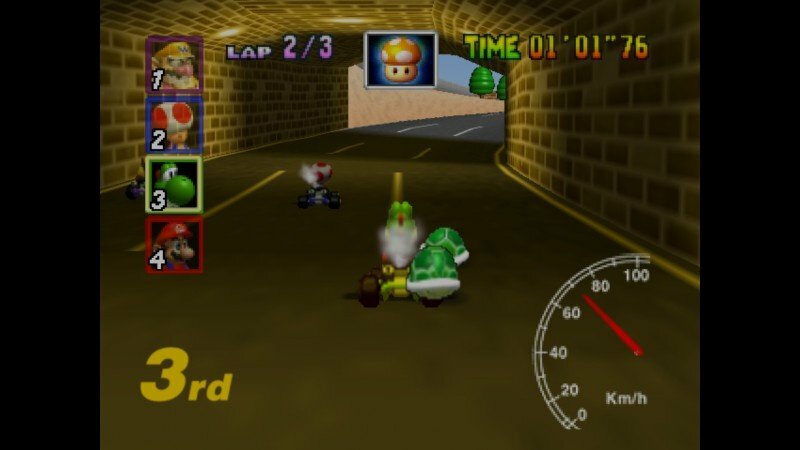 Having battled through the field and put in some fantastic lap times you can find yourself in first place only for someone to fire the blue shell, which then tears through the field hitting you at the final corner to destroy your race. Some people feel it's unfair whilst others think it adds to the excitement. This writer has no strong feelings either way, but simply hopes that the person who came up with the idea was fired. Out of a cannon. Into shark-infested waters. In a change from Super Mario Kart (that has stuck for subsequent releases) CPU controlled characters also collect special items, although they mainly seem to be given banana skins and fake item boxes. Aside from bumping into you (which admittedly can knock you towards danger) they don't really attack. Instead the main trouble they cause is from the fact it's difficult to pull away from them. You can be in first, you make some mistakes and then you find your rivals directly behind you. That's understandable but often you can send someone into a spin, take a series of corners without error, use a super mushroom and still find they're right on your tail – perhaps they found a secret stash of golden mushrooms. It's not just a case of them upping their game to match you, the game keeps the field close together and should they start to pull away too much they'll forget how to steer, collide with something and allow you back into the mix. 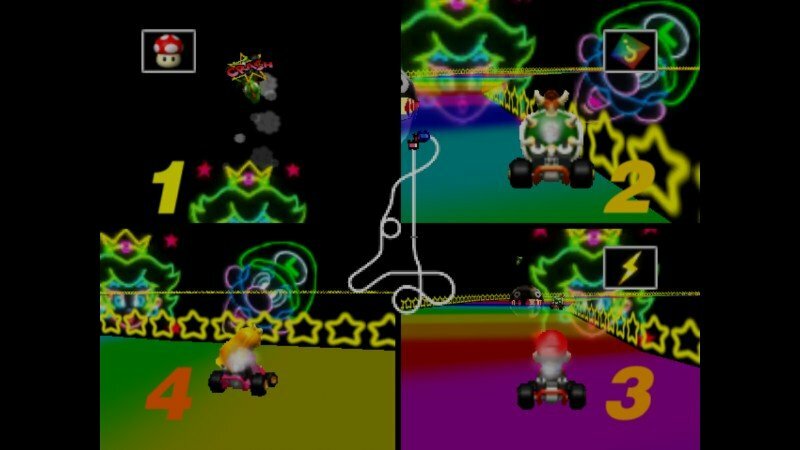 With everyone close together it's a lot of fun to work your way up through the pack, weaving around some karts, fighting with others for a bit of track, narrowly avoiding a penguin and then taking someone out with a well timed shell. The downside is it sometimes feel like you're battling to complete faultless laps rather than racing. Should you be in second place, midway through lap 2 with a red shell there's no reason to use it. You could take out the race leader, send them plummeting in to a pit and move up to first, but what's the point when your rival will be back trying to pass you before the final lap has commenced? Best to save it, stick with them and use it towards the end of the race. For those seeking human competition there are a number of multiplayer options available for two, three or four players. The versus mode sees you race each other on any of the tracks. There are no CPU controlled racers, but bombs are scattered about that may wander into you. 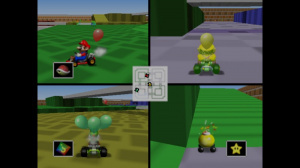 Alternatively there's the Battle mode where you drive around one of four maps, collecting items to pop the balloons attached to your opponents. Should you be playing with three or four players there's a visual downgrade with some effects (and a paddle steamer) removed and there's also a lack of music. This can feel strange, but the chaotic battling provides a lot of enjoyment that greatly reduces this disappointment. Much time can be spent with the multiplayer modes, but like many racing titles a lot of replay value can be found with the time trial mode. Trying to find the best point to slide around a corner, or where to use one of the super mushrooms you are given, keeps you busy as you try desperately to improve your time by a small fraction. Due to the lack of a Controller Pak, ghost features are limited. Retry a track immediately after your first go and the ghost from your previous attempt will race around the track with you – although it disappears should you pause the game. Not being able to save the ghost data is disappointing but there's a great feeling from managing a new previously unthinkable best time and, should you be extra impressed with it, you can post a screenshot to Miiverse to see how you compare with players from around the globe. It's more Mario Kart, offering the usual colourful frantic action, and although the rubberband AI can cause irritation the racing remains entertaining. Time trials will keep you busy after you've cleared the cups and then there's the multiplayer options too. The loss of the music when playing with three or four players is disappointing but there's plenty of enjoyment to be had from these modes. 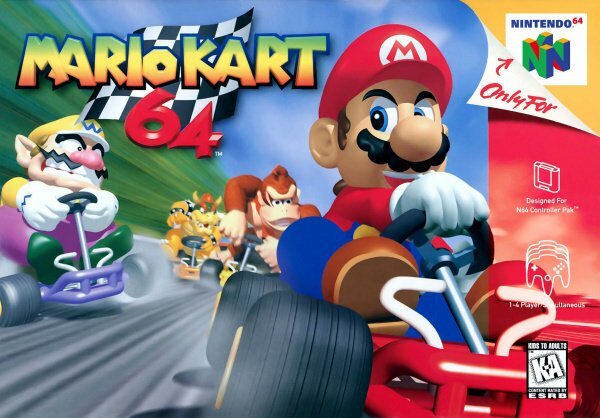 Mario Kart 64 has its faults, but there's enough fun here to keep you (and your friends) returning for more. Downloaded it straight away, but it is really showing its age now thanks to later games. Eh. Not really. It would be nice to have but doesn't ruin the game at all by being absent. What? Shouldn't that be fixed? 8 from 10 means very little unless compared to something else relavent. As Bass-X0 said it is showing its age and games like this do show their age rather than look retro.But if the price is reasonable and someone is a fan then I guess all is good. Well almost. I didn't spend nearly £300 on a Wii U with HD graphics to play ropey old N64 games. I am all for including these games as well as new games but not instead of. If these games are fillers between the very few Wii U games to keep us onboard until we spent another £300 then the games should be free. I bought this as I was a fan of the original. I have just one thing to say. "Hey Mario kart 8! MAKE WITH THE ONLINE BATTLE MODE ARENAS DLC ALREADY!!!" @zool you're talking about a game showing it's age but your name and avatar is Zool?!? I love the game but wasn't the last game released 20 years ago? @GrailUK agreed, I've still not let MK8 off for the battle mode being ruined! This is still the best battle mode of any Mario kart. It's probably second in overall multiplayer imo due to double dash being soooo much fun in co-op!! More than 20 years ago I think. But I would not want to play it on the Wii U either. Like I said its not what most people bought the Wii u for. If it was just old games we could have kept the Wii's for playing them. To be honest I think this Mario Kart will forever age the worst out of the series. If you look back not even 10 years ago, this was still hailed as not only one of the best mario karts, but also one of the best racing games ever, but if you look at it now, a lot of its flaws are starting to show. Still the best Mario Kart in my opinion. I think the rubber banding was way worse in Mario Karting Wii. Meh. The worst of the series IMO. lol at that 8 score. Let's see. This thing is only multiplayer only (which is awesome, mind you). Other than that, there's really no point in single player once you have mirror mode. The game suffers from weird physics. Which in turn turns the game on who completes the track using the glitches. The only prop I give to this game is the controls. IMO, it has the best of both worlds: the flexibility of SMK and the rigidness of the later games. Did they ever fix the bug where certain tracks, like DK Jungle Parkway, run at twice the speed in multiplayer? I'm enjoying it but It's no Crash Team Racing, that's for sure. Definitely the least polished Mario Kart game. I still love it though! It is funny and has some of the best multiplayer around. ↑ Yeah, it's definitely nowhere near as good as that game. Definitely my favorite Mario Kart in the series, mainly for the controls. And in my personal opinion, the chaos in this game feels fair compared to the later games. @MeWario @BearClaus I did really like Crash Team Racing but the part which irritated me the most was the bouncing/jumping mechanic, it was quite inaccurate and frustrating when you were trying to get platinum medals. MK64 is still a great game but for me it's Diddy Kong Racing all the way! Does anyone remember Mickey's Speedway USA? It was released late in the N64's lifespan - that was a cool kart racing game too. I do believe that my version is not saving times! I really wish they went with 3D models for the characters instead of those awful 2D sprites. Mario Kart is one of those series where after playing the latest 3 the other ones just don't hold up. My favorite tracks from it are in other games I have as well. I might get it when I have more funds for some battle mode highjinks but there are other N64 games I would much rather have on there. Best thing about this game is Wario, I put lots of hours into it on the N64. I haven't got this game yet i will get it soon. i have this game on the original wii virtual console but it's not the same but still. this game looks really awesome. @zool This isn't filler, it's a virtual console realease. I really don't see why your complaining. @Gridatttack I just want to applaud you for fair criticism of the game. While I don't totally agree as I still play it single player all the time and dont rely on 'glitches' to win, I actually have fun with the rubber band AI because it makes every race a challenge even if you are a seasoned veteran like myself. Still, I respect your opinion of the game and appreciate someone saying fair positives and negatives instead of 'MK64 sux hrrd lol' as is the usual criticism on the internet. Lack of music? Is that a WiiU thing? I don't believe I've ever played this game with more than 2 people... maybe 3 once but I thought there was music. It's that way on the original. zool looked great but played awful. as forgettable as most from the day. MK64 is a 10/10 for my money! @AshFoxX I see. I suppose different tastes. I just get bored with MK64 single player. For single player experience in MK, I would go with super circuit (due to the insane amount of content/replay value). But IMO, what this excels in is in the controls. I feel it has the fairness of the new ones and the flexibility of SMK/CC, so you can do some crazy stuff. The thing is, while the rubberbanding makes it challenging, its programmed to really tick one off. Pretty much, you have to play perfect, as a tiny slip up will make the computer pass you, as they are programmed to keep always on your toes, whereas in other SMK, if you had the skill, you could always maintain the lead and leave a little margin for error. Not to mention, the game is programmed wrongly so if the computer gets ahead of you by a margin, the rubberband kicks in again, pretty much making it impossible to win. I'm willing to bet it was only rated so high because of nostalgia. Which is pretty disappointing NL. Never did enjoy this back in the day.If I remember correctly I took it back to the shop to exchange for something else after 2 or 3 days.Diddy Kong Racing was the place to be on 64. 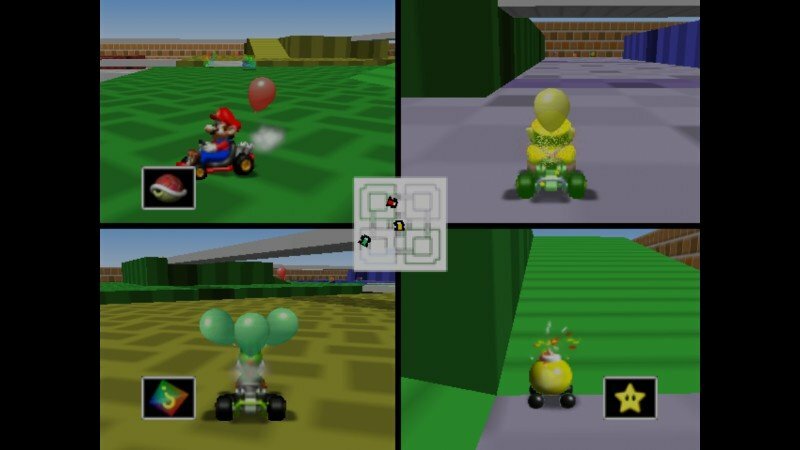 DKR has always been my preferred kart racer for the N64; I am a rare N64 gamer who doesn't much like Mario Kart 64 unless it's 4 player racing. I preferred the Snes original and many of the subsequent releases. Whats wrong with me - I am buying games I already have! 😄 Good marketing! I'm with others that this is the weakest entry of the series. The rubberband AI nearly ruined it. That said, it's still a good game and I played this game to death when it came out. @Gridatttack To be honest, I think MK64 is one of the better titles. The Mario Kart series is my favourite out of any franchise; so no distaste towards any of them, but I personally believe Super Circuit is a far worse game than 64 is. And Mario Kart DS is very bad as well, other than the fact that it introduced online and added more courses. Everyone has opinions though. I just think there are definitely worse entries in the franchise. I still love this game,I remember when it first came out,I skived off school so much to play it! Comparing dkr n mk64 is not really fair imo,dkr definitely wins on content though,both epic games. @Plainsville lol I don't think everyone will ever agree which is the best Mario Kart! Some of my favorite college memories involve myself and 3 friends, adult beverages, an old 23" zenith tv and MK64 running at about 6 FPS in 4-player-split screen mode. I loved this game, its a shame there couldn't have been a few minor improvements added to the vc release - like CPU racers on 4 player vs mode. They don't alter the games from their original release. They may as well add eight player online racing if they could alter it. the new Mario Kart games has more features then Mario Kart 64 imo. This was my favorite Mario Kart until MK8 came out. I was still pulling it out (on my N64) well into the Wii era. It's one of the games that defined my early console gaming career. That said it's aged rather poorly and what I like most about it these days is the nostalgic feelings it provokes. 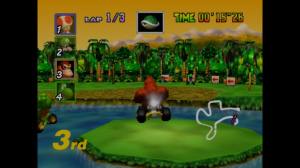 I definitely prefer Diddy Kong Racing over pretty much all of the Mario Karts. That said, MK64 is the N64 multiplayer title I played the most with others, and it's probably the only one besides Perfect Dark that I put the most time into overall. For console entries, I think only MK Wii really topped MK64 overall. 8/10 might be a tad high without any special additions, and if you're someone who doesn't enjoy battle mode. If you do enjoy battle mode, Diddy Kong Racing is still the gold standard to beat for kart racer battling, but MK64 is pretty good too. I had a controller pak for my N64 and never used it for this. The grand prix and battle modes were too much fun, especially that skyscraper map. Mario Kart 9 really needs to get battle mode right. Having an absolute blast playing this again. We can only hope and wait that this will come to North America sometime within the next 3 years. Smh. It's disappointing the lack of ghost feature and the pricing well, expensive once again. This Mario Kart has great circuits and music, but I agree with a few guys here, Diddy Kong Racing was better in every sense. I remember how amazing Diddy Kong Racing was in 1997, and still now the only bad thing you can say about it is the frame rate. Diddy Kong Racing and Goldeneye are two reason to keep a N64 (as they won't be re-released any time soon). @bezerker99 3 years is too long for Mario Kart 64 to come to Wii u virtual console I hoping it will come soon so I can play it using the game pad or pro controller. Where is Mario Kart 64 for Wii u virtual console in North America I am wanting to download it I contacted Nintendo of Americia about it if I try to play the Wii verson of it the game pad says Wii software cannot be controlled by the Wii u game pad and the pro controller won't tern on if Mario Kart 64 doesn't get released soon Mario will lose the race as player 1.